Do you wake up with pain under your heels in the morning, or are they sore after a long day of work? Heck, they might just be sore all of the time. Heel pain is one of the most common problems that your feet are likely to suffer from. Our podiatrist help people like you improve your pain every day. Today I am covering tip number 2 of 5 on things you can be doing to help ease your pain. Check out our blog to find more tips. The muscles within the arch can be a big contributor to your pain. So getting in and massaging the muscles can be really beneficial. So how do you do this? Keep reading to find out. How do I massage my arch? A ball the size of a golf ball works best for most people. It does not have to be as hard as a golf ball, in fact I have a lot of people using a child’s bouncy ball of that size. Something the size of a tennis ball is too large for most people and will not get into the smaller muscles of the arch. Twice a day – morning and night. Doing this before getting walking in the morning can help to reduce some of the first step pain for a lot of people. Start by sitting in a chair, place the ball on the ground and then rest your arch on top of your foot. Start to move your foot around on top of the ball. While you are rolling around, you are looking for any sore spots in the arch (not under the heel bone itself). If you don’t feel any at first, you may need to push a little harder. Once you know where the sore spots are, pick the worst one and go to work on it. Do this by pressing on the area with the ball so that if feels like a good pain (a 3-4/10, it should not be making you pull faces). Now, the pain should begin to ease as you hold this, and once it is no longer improving (about 30 seconds), move onto the next most tender spot. What happens if the area doesn’t improve or gets worse? Stop working on that area. If it hasn’t started improving in the first 30 seconds, move on. Also, if the pain increases, reduce the pressure. If this does not help, move onto the next spot. Try it again when you next do your exercises. 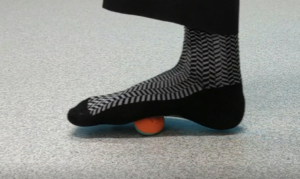 If the spot continues to be very painful after 2 days of trying, it is time for you to seek our professional opinion to confirm the diagnosis, as other conditions can mimic plantar fasciitis. As you progress with this exercise over time, these sore spots should reduce and the exercise becomes quicker. Now, stay tuned for next week’s blog which will cover how to stretch the plantar fascia and arch muscles. If you missed last weeks on footwear for heel pain, here it is.